Have you recently been hired at a company where an HR department has yet to be started? Are you being asked to build one up from scratch but have no clue where to start? Here are a few tips I would have loved to have been given when I started off my career. 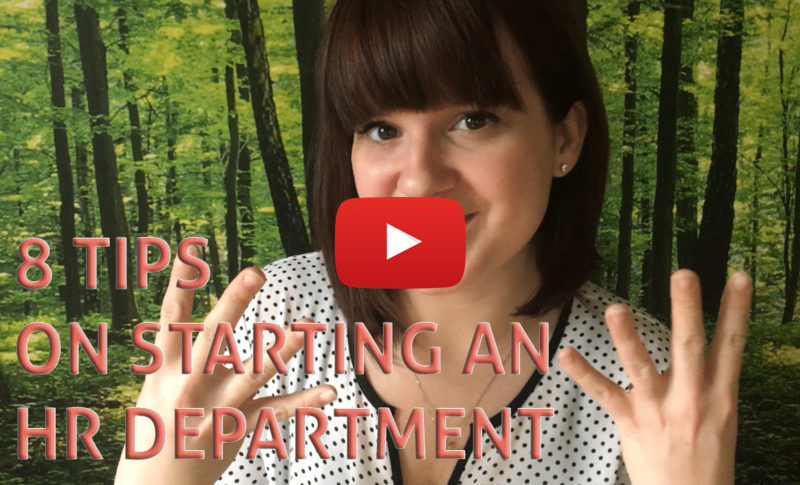 Here’s hoping that these 8 tips on starting an HR department will prove valuable to you! Perhaps you’ll want to start turning everything upside-down upon your arrival. You must bring in a wind of change and ensure its proper management, but attempting to change everything as soon as you start off can most likely off-put employees who were there before you. Before acting, analyzing the way the company works as well as its current employees is an important first step. How do people see the company? What brought these people to apply there in the first place? What is their perception of management? What motivates them to show up to work each day? Do they have any frustrations? Are these shared by the majority of employees? Have they shared their suggestions for improvement with management? How were these suggestions perceived? This also goes for employees in management positions. Try to validate whether or not employees and managers share the same point of view. How well do they know their employees? What are the team’s current projects and which ones are currently planned? Why did they insist on starting an HR department? How do they believe you’ll be able to help them reach their objectives? What are their expectations for the HR team? While it’s important to consider the projects your managers have in mind, always remember that it is your role to evaluate if they are appropriate and, more than anything else, to know how to get them started. Perhaps management have, consciously or not, created a gap between themselves and their employees. If this is the case, they can possibly be unaware of current issues being faced on an operational level. That’s why you’re here: to help bridge the gap between management and employees. Most of all, never be afraid to challenge management’s current way of doing things. You don’t want to start simply challenging their point of view for no reason. However, if you only do what is asked of you without making your opinion known, they’ll possibly struggle to see the value of having you attend their strategic meetings. By bringing innovative and constructive ideas to the table, they’ll be more likely to listen to what it is you have to say and, as such, they will grant you more freedom to do things as you see fit. This is how you can one day become a key player in the eyes of your organization. It is possible that management have already prepared a long list of things they’d like you to take care of upon your arrival. Starting an HR department means that employee will (hopefully) see you as a key asset to the organization and offer you a vast array of small projects, with each one being more urgent than the last. Among these small projects you’ll find writing up contracts, calling up a potential candidate, responding to inquiries coming from the Office québécois de la langue française, and writing up job descriptions. By performing these tasks while you analyze the organization, you’ll gain credibility since you’ll be building a track record of completing projects, even if they’re small-scale ones. Your bosses will feel as though they can have confidence in your capabilities of taking their projects and completing them. You must not lose sight of your longer term projects in favor of these smaller ones: your long-term plans are the ones that will have the most profound impact on your organization. Examples of these large-scale projects are re-thinking the employee evaluation process, writing legal HR documentation and building a group compensation policy (among many others!). It can be easy to end up eyes-deep in day-to-day tasks and lose sight of the bigger picture. It can be quite important to take a day here and there to re-think your way of doing things to try and optimize your processes. Starting an HR department is one thing, but helping it evolve at the same pace as your organization is worth its weight in gold. What is your comprehension level of the current situation? How do you think these recommendations be prioritized? What is management’s perception? What are the possible issues these projects are likely to encounter? What changes need to be made to reach the goals of these projects? Once prioritization is complete, you’ll then need to come up with a timeline. Personally, I usually opt for splitting the year into four phases: Q1 (January to March), Q2 (April to June), Q3 (July to September) and Q4 (October to December). Afterwards, I recommend taking time to plan your projects out on a regular basis, such as weekly or bi-weekly. In Agile/Scrum wording, this is called “Sprint Planning”. Even if you’ve been reading Agile project management books, remember that these methods were initially thought up specifically for software development. You’ll need to adapt them to your own context to help on starting an HR department. Here are a few ways you can let Agile project management inspire you when it comes to human resources. As the person responsible for everything HR-related, you’ll be quite in demand with both employees and management. Consider dedicating 50% of your time to your large-scale projects and keep the other half free to better respond to any spontaneous requests that might end up on your desk. It’s possible that this division of time isn’t ideal for your current situation. Make sure to base these on the actual needs of your organization. One thing is certain: never book 100% of your time as you’ll end up overwhelmed and either end up working overtime or members of your organization will have issues meeting up and speaking with you. Even if you’re the only person working towards starting an HR department, it’s quite possible that your team will end up growing as the days and weeks go by. Most importantly: never wait until you’re at your limit! The more you wait, the more your hiring decisions will be tainted by the urgency of the situation. It’s also possible that management will refuse your initial request for help. Plan ahead and, most of all, make sure you’re well prepared when the time comes to make your request for growing your department. Make sure you take the time to build a solid foundation for the future. Are all your potential candidates listed in an Excel spreadsheet? Even worse: is all their information spread out across your email inbox? One thing’s for sure: if the day ever comes where you start receiving 300 resumés per month, you’re in for a bad time. …and much more, depending on your choice of ATS. If your organization is lacking space in their budget for such tools, take note that products such as CangarooHR and CangarooATS are offered for free if you transfer your insurance and group annuity brokering services to them. By using the right tools when starting things off, you’ll end up saving time and money as well as solidifying your position as an important strategic partner in the eyes of your organization. By having a large network, you’ll have experts just a phone call away whenever you need them. If you’re alone in starting an HR department, having a second opinion at arm’s reach can be a life-saver. Don’t be afraid to admit that you’re not able to complete a specific task. Keeping a positive mindset is important but if you don’t have the necessary skills, you’re better off accepting the fact than constantly pushing back a project that you’ll never complete. Meet up with them on a regular basis, ask them questions and take interest in them. They’re more likely to confide in you if you build a solid relationship with them first. Your mission is to help all members of your company find solutions on their own. While you can help guide them, remember to teach them to be autonomous so that they can manage things while you’re unavailable. If you have any questions, feel free to reach out to the Ordre des conseillers en ressources humaines agréés. They’ll be able to offer you all the support, training and documentation that is necessary. Starting an HR department is quite a daunting task. You’ll be working hard and you’ll most likely encounter important obstacles along the way. Never lose sight that overcoming these challenges will help you move your organization into the future and further your career. Never be afraid to jump in head-first and take risks!